Mardy Fish shows he's back in tennis shape with long, three-set match. Atlanta tennis fans had to have a smile on their face as American Mardy Fish, a two-time BB&T Atlanta Open champion,made a return to tennis on Thursday at the BNP Paribas Open in Indian Wells, Calif. 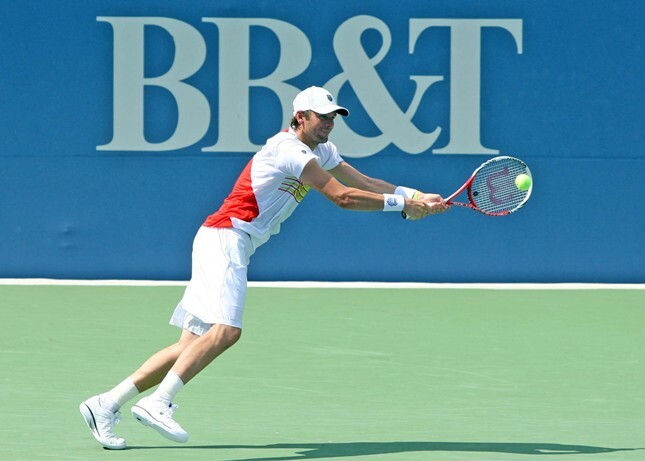 Fish, away from competitive tennis for almost 18 months, used his protected ranking from 2013 to enter and almost stun another BB&T Atlanta Open crowd favorite in Ryan Harrison. Fish announced his return to the sport with a simple Twitter post he made back in January. Since then he has been training for this comeback and he even played doubles in a ATP Challenger event in Dallas to get his feet wet. Thursday's match featuring the two Americans may have ended with Harrison winning a third-set tiebreak to defeat Fish 6-4, 4-6, 7-6 (3), but the match was about Fish feeling like he once again belonged on the court. After the match, Harrison was smiling not only because of his first-round victory in a ATP World Tour Masters 1000 event, but because he said it was good to see Fish back on the court. Fish's troubles began when an irregular heartbeat was discovered in 2013. A series of other medical issues followed by test after test pulled Fish off the ATP World Tour. Fish had problems with anxiety, saying he was often overly worried about his heart condition. Even in this defeat, Fish was able to survive the physical battle in the desert heat of California, as he held two match points. He said for his comeback to be successful, it's about being mentally stable. "One of the things I need to do on the court is to be pretty even keeled and positive," the 33-year old Fish added. Fish hinted he may be thinking ahead to the Emirates Airline U.S. Open Series and the US Open in New York.